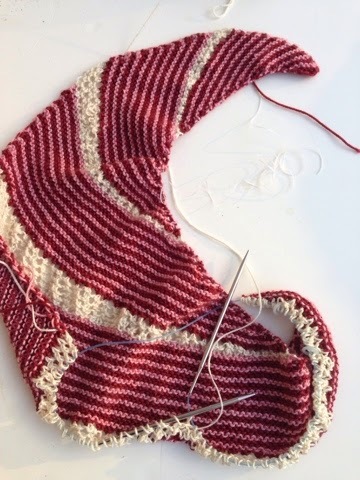 Even though I have a huge number of projects on the needles (I probably can't even count high enough to figure out how many), I felt the need to start one more to have the perfect travel knitting. I am going to have a long trip down and back to Miami because I'm taking the bus to O'Hare Airport, and that's a three-hour bus ride! 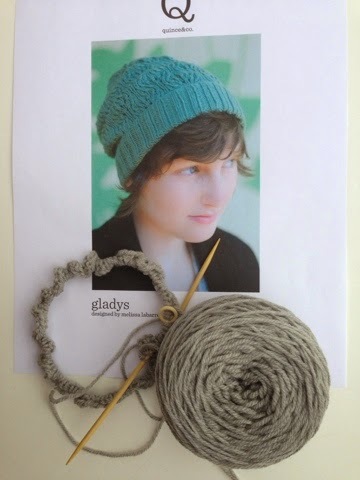 Gladys is a hat pattern by Melissa LaBarre, designed for Quince & Co. I picked it up a while ago, and even bought the Quince & Co yarn, Chickadee. It's exactly the kind of hat I love, lacy and slouchy. The lace is fairly simple, so I think it'll be a good travel pattern. Spring has hinted that it is getting closer. Yesterday morning I went for a lovely walk with friends. Lisa is an avid (and talented!) photographer, so I was inspired to whip out my iPhone, which really does take decent pictures. Still, I'd like to get back into using my Rebel SLR. Tomorrow I'm off to Miami and my daughter. Spring break is awesome! Don't forget to check in with Nicole for Keep Calm Craft On. Have you read the book Quiet: The Power of Introverts in a World that can't Stop Talking by Susan Cain? Even though the title says it all, the book is still worth reading -- especially for those of us who crave, even need, lots of time alone. I had no idea that there were so many other people out there who savored solitude. Much of my mental real estate is devoted to balancing time alone with social time. I'm not a hermit, so I need both, but the right balance remains elusive. I get irritable when I don't have enough time alone, but I get depressed without enough contact with other people. All of which is to say that I am enjoying a day of bad weather on the first weekend of my spring break. I'm trying to balance creative time with, well, cleaning. I wouldn't want unannounced company to show up today because the house just isn't presentable. 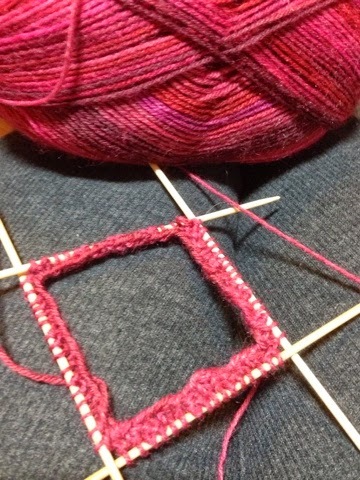 I've started a pair of Trellis Socks, the pattern than I designed, in reddish-pink. The yarn is Trekking XXL, which never fails me. I need a pair to use as models for the pattern. I hope to have rough directions drawn up this week so I'll be ready for any test knitters who might be interested. I'm going to release it as a free pattern, but I still think a test knit or two would be good. As for being busy. Whew! 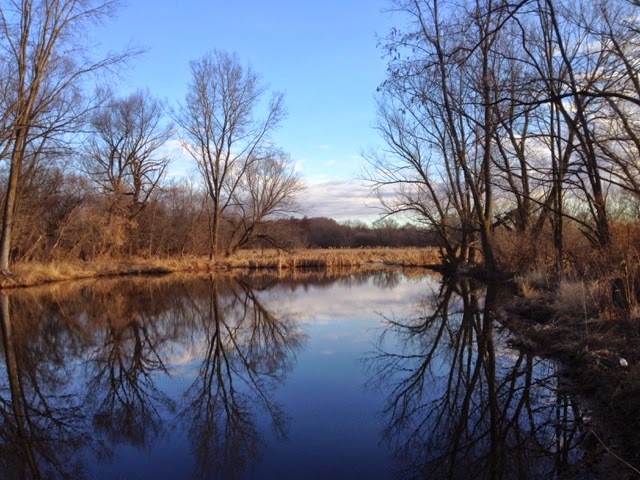 Last weekend I was in Washington, D.C., for a training on Mindfulness in the Classroom. The training, put on by Mindful Schools, was awesome. The instructors really know how to teach and have suggestions for working with the hardest kids (something many trainers like to skip over). And meeting 100 teachers from the eastern United States was fascinating. The expense of the trip was worth it because in addition to the training, I got to spend time with my brother, his wife and their daughter; see my old friend Jeff; and spend a half day at the National Gallery. I flew back on Sunday evening and had to be ready for an IEP meeting at 8 a.m. on Monday morning! The week was relentless. Early in the week, a student I don't know walked up to me in the hallway and pushed me; then, Friday before lunch, a student burst out of a room and smashed the door into my right hand, smack on my index finger. The entire finger is black/purple and swollen, but I can still knit and bead -- so it's not a tragedy! But getting injured, even by accident, is emotionally exhausting, so spring break comes at a good time. I have four days to recuperate before heading off to Miami to visit my daughter. Well, this seems like it's more than enough for one post. Now I can get caught up on your posts! What do you think? Can you tell that the pink faces are supposed to be cat faces? I think they look more like mouse faces, but that fits the cat theme, too, I think. The hat is knit from Berroco Vintage, which was left over from The Favourite Things Cowl and the patterns are from a variety of sources, but mostly Mary Jane Muckelstone's books. The cat is from her 150 Scandinavian Motifs book. The hardest part was figuring out the right number of stitches to cast on and what size needles to use. The hat is wearable but the slouchy top is not exactly right, so I'm working on a second hat, but this one features sheep. 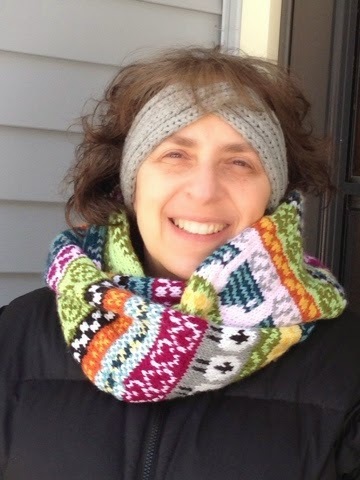 I am hoping to come up with at least one hat design that I can release as a free pattern this summer. 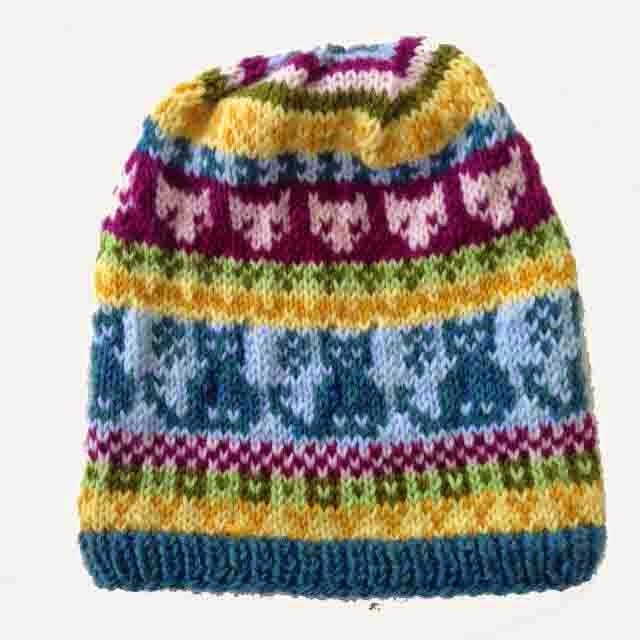 I made up this hat as I went along, which was even more fun that watching self-patterning sock yarn play out. 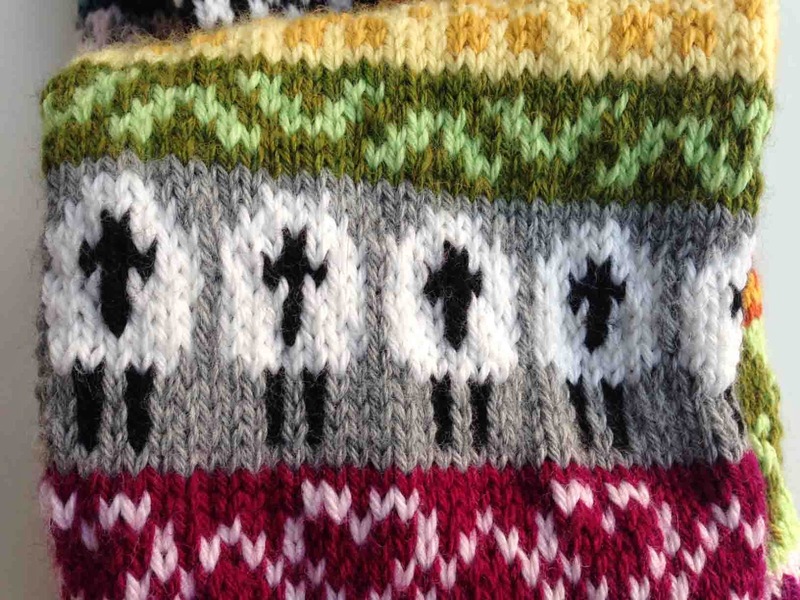 This is the thing about knitting; it has endless, fascinating variations! It was a weekend of retreats -- but very little knitting. 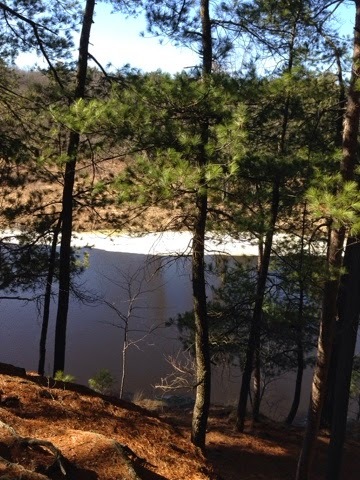 On Saturday I drove up to Wisconsin Dells for a writing retreat. About 20 of us gathered at a nature camp and we both hiked and wrote outside. For the first time since fall, the sun's warmth promised that winter is over. I love views like this one where you can see the last vestiges of winter floating down the Wisconsin River. Why is it that you can drive 45 miles away from your home and it feels like you've entered a different world? This morning I drove back to participate in a seminar connecting mindfulness with the Jewish tradition. For the first time, I ate an entire meal mindfully, meaning we ate in silence and concentrated on every bite. I was actually one of the slowest eaters. This was unexpected as I usually inhale my food. I wouldn't want to do it all the time, but it was an amazing experience. A simple egg salad, that would barely notice at a typical meal, turns out to contain a multitude of flavors and textures. I hope you had an enriching weekend and are ready to face the week! My Favourite Things Infinity Scarf is finished! Just in time for beautiful warm weather! Oh well, it gives me something to look forward to next winter. 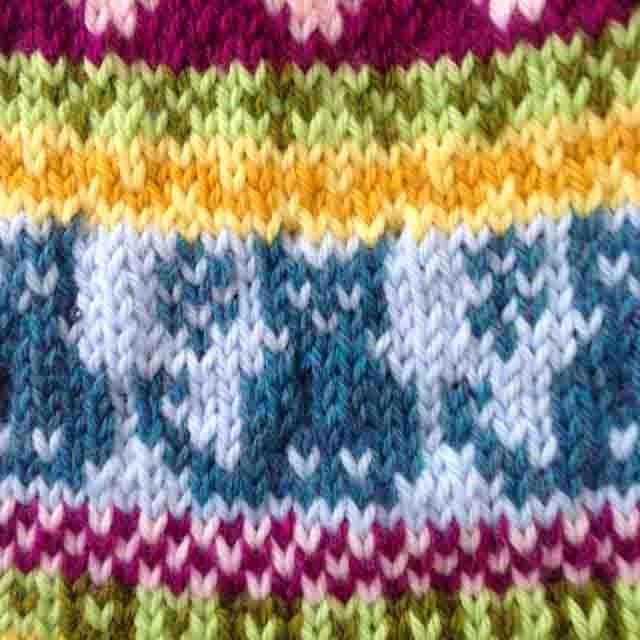 I will share details after it is done blocking and I can get some close-ups of the motifs. 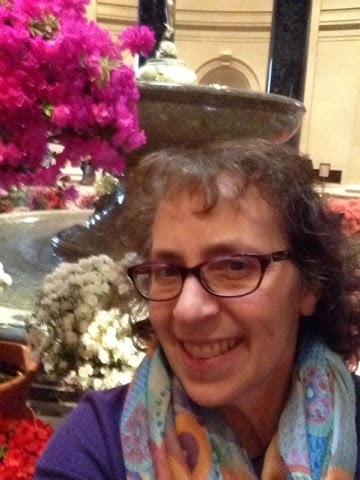 I'm heading into a day of teacher training, followed by a hectic weekend: A retreat for the writing program I participated in last year and then a day-long seminar on Torah and mindfulness on Sunday. I am a bit worried about having no downtime, but I can't imagine passing up either one of these opportunities. I love how the ivory sections contrast with the pink stripes. When I started this project, the directions seemed so complicated, but they are well-written and now the entire pattern makes sense to me. I think it will be great as a summer shawl -- one for air conditioning and evenings. I decided against going to Knitting Guild last night, even though it's always good. In my own reading and on NPR, I've been encountering a lot of information about how harmful a lack of sleep is. Too little sleep contributes to weight gain, irritability, inflexibily -- all things I want to avoid! As someone who has to start work by 7:20 a.m. (at the latest! ), I struggle to get enough sleep. I really need to be in bed by 8 or 8:30, but it's hard to do that and also have a social life! So, I went home, had a bowl of soup, and got into bed with a novel I've been wanting to read, The Blazing World by Siri Hustvedt. Before long I was drifting off. I must do this more often. Join me in Keep Calm Craft On with Nicole. I've read two books recently that I highly recommend. The first is an adult dystopian novel that did not receive the attention it deserved when it came out last year, but was a favorite of many reviewers. In general, I've had my fill of dystopian novels, but any genre can be good if the writer makes it so. 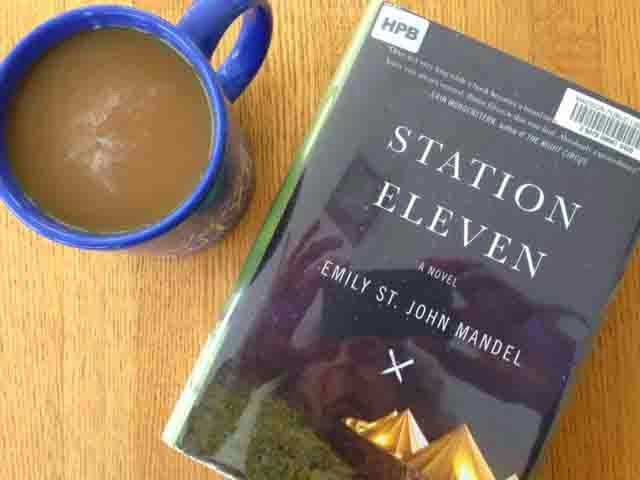 Station Eleven by Emily St. John Mandel is set in a future American where the population has been ravaged by a worldwide flu epidemic. Spanning two decades, beginning with the day the epidemic hits the Midwest, the book centers on a ragtag group of Shakespearean actors and symphony musicians that travel the Midwest, performing the the little settlements that have survived. It is one of the less-grim dystopian novels that I've come across, and I appreciated that. The intricate plot kept me turning pages, and the characters are so vivid that you miss them after you read the last page. The book also raises philosophical issues about art and history and change that merit contemplating. One of the central themes dances around this quotation from an episode of Star Trek: Voyager: “Survival is insufficient." 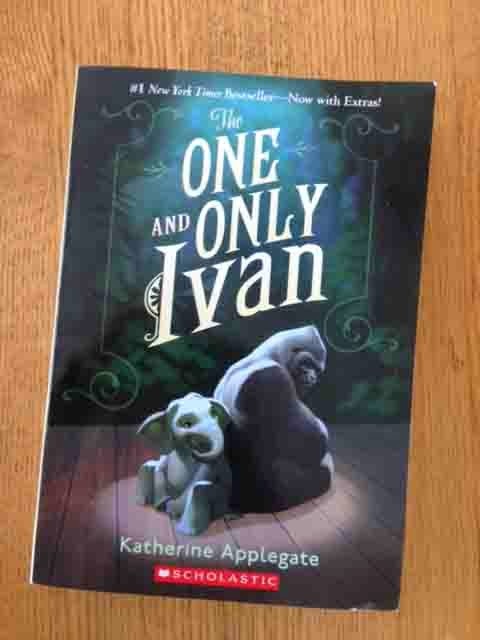 The One and Only Ivan is based on the real-life story of a Silverback Gorilla who lived at a shopping mall. I generally hate books that personify animals, but this one -- written for children -- presents very believable voices for Ivan, the gorilla, and the other animals who live in this small zoo. One of my students recommended this book, and I'm so glad I took him up on it. I hear that it is a very popular read-aloud in elementary schools, and I can see why. The story deals with big issues -- treatment of animals, how children are affected by the parents' economic situations -- very gently. And it is a good old-fashioned read! 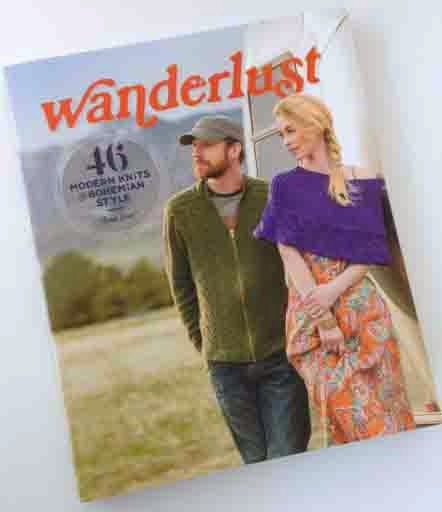 I saw it at last month's Knit-In and I knew I was going to cave for a few reasons: The patterns are gorgeous; they are all worsted weight, which I am loving these days for its quick-to-knit-up quality; and the patterns look very well-written. Besides, I like to buy from the sellers who come to events and sit at their booths for a couple days! I'm in a mood to indulge myself, though, as I got some very, very good news yesterday. A year ago, a scan revealed a nodule on one of my lungs that could have been cancerous -- but was too small to be diagnosed. A scan this week shows that the nodule is gone! At the same time, it's also been a sobering week. My husband was diagnosed with hypertension. One of my brothers diagnosed with a heart condition that isn't really treatable and can cause heart attacks; and the husband of one of my childhood friends died unexpectly in his mid-50s. This is where I wonder if I shouldn't work less and spend more time with people. Given the declining funding for for education, that's easier said than done as we are being told to do more with less. Still, I know I need to achieve a better balance in my life. I adapted the sheep from a design I found somewhere (details to come with the FO post). I am quite happy with how they came out and inspired to adapt and make more of my own motifs. If you are tempted to knit this cowl, do heed the warnings about how heavy the cowl is. You cast on 72 stitches and knit in the round for 5 feet -- in worsted weight! I suspect I'll mostly be wearing this outdoors. I guess that may be the one reason to enjoy the long winter we are experiencing here in Wisconsin; one to five inches of snow expected here today with temperatures plunging back into the single digits tomorrow! Another good thing about this weather: I have a lot of work to do before the school year ends so I'm going to try to put in some long days before the weather improves! Join me in Keep Calm Craft On with Nicole today!